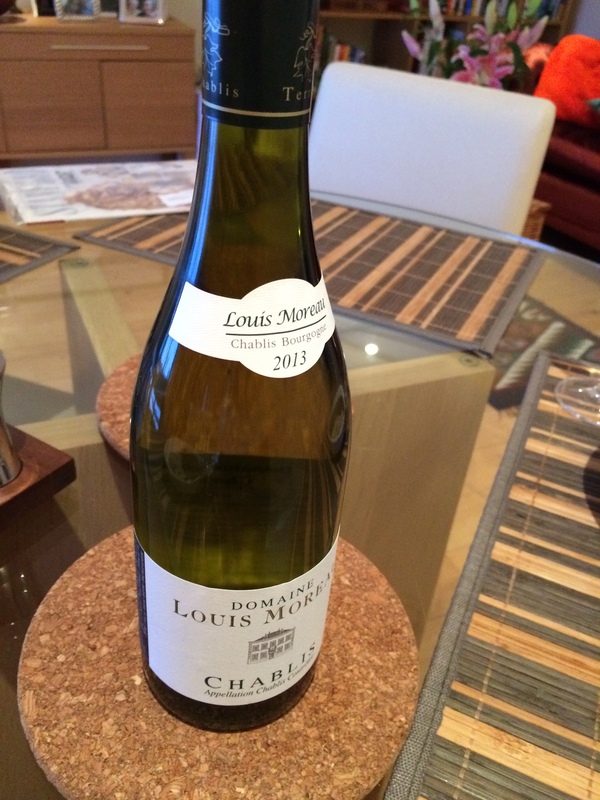 A few weeks ago, I was approached to enter into a wine pairing competition to show the versatility of the Chablis wines and foods of all sorts. Naturally, being me, I was super excited about the challenge and looked forward to creating a great combination. Over the month of May, I took a trip down memory lane, seeing you, Fran, and reminiscing about our times at Clark University, attending my sister Daphne’s graduation which at some point got me remembering our graduation (nearly 10 years ago!!) and many other amazing memories from Worcester, MA. So what did I end up cooking? During my recollections of those fond times, I remembered a dish that I associated with celebrations, which I religiously ordered any time we went to Sole Proprietor: The Rare Peppercorn Crusted Tuna Steak stuffed with Feta and Sun-Dried Tomatoes. I could not get enough of it. It was so good that I only had eyes for this dish, I have no idea what else they have on the menu despite having gone there at least 10 times (FYI – extremely unusual for me). So for this challenge, I decided that an amazing closure to my fantastic holidays and memories would be to recreate this, in hopes it paired well with the delectable and fresh Chablis! The verdict: success!! 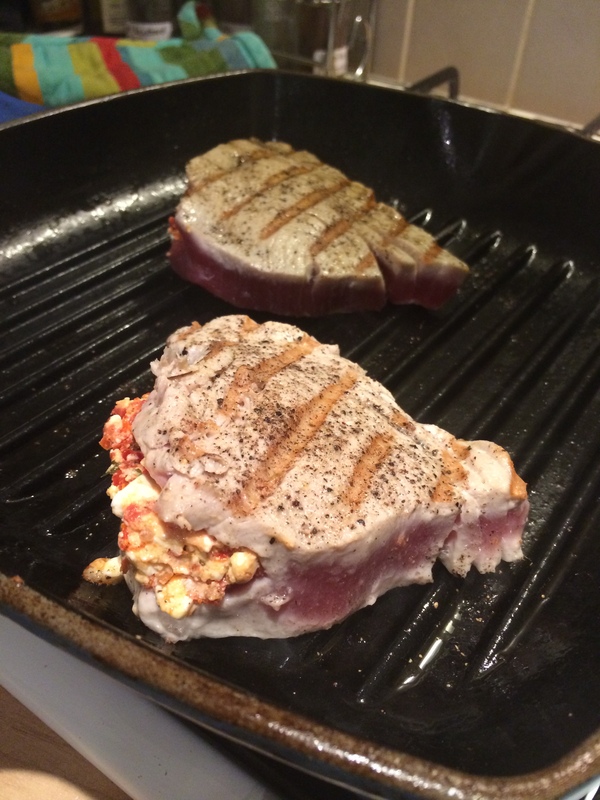 Although feta + sundried tomatoes + rare tuna steak are quite strong flavors, they worked so well together and the wine gave them an amazing lightness and crispness to finish. 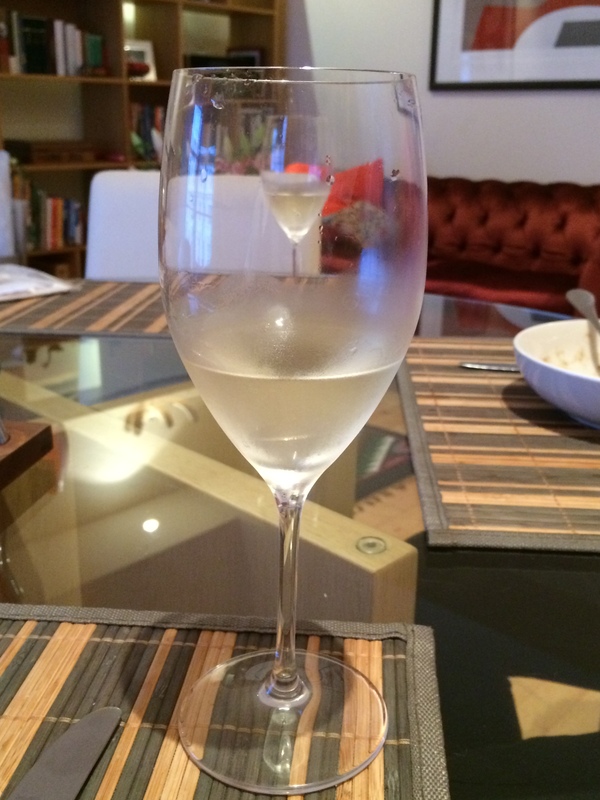 Also, reminiscing about our fun Clark times with J tipped the scale in my favor – thus fulfilling the secret to a good wine pairing which I was entrusted with! While the pan is heating, smash the feta and sun-dried tomatoes with the back of a fork to make a paste. With a pairing knife, carefully slit each tuna steak through the inside of the steak to make a deep pocket (careful to cut across evenly, not to pierce the flesh at the top or bottom). 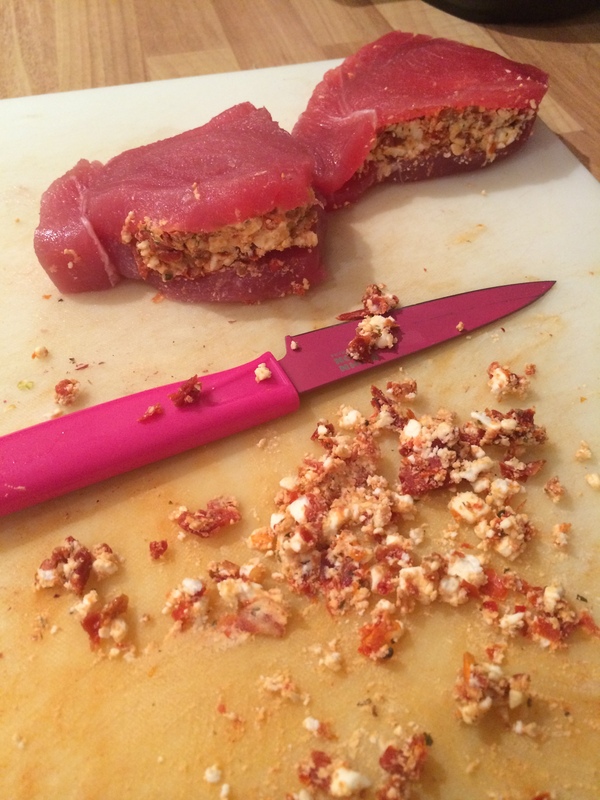 With a spoon, carefully stuff the feta mixture into each of the tuna steaks until it reaches the edges, as per the photo. Brush each side of the steak with olive oil and grind fresh pepper until a light film is created on either side. Place on the griddle pan and sear for 3 minutes, carefully flip over and cook for another 3 minutes. (The top and bottom should be cooked, but the center should maintain its lovely juicy magenta center.) 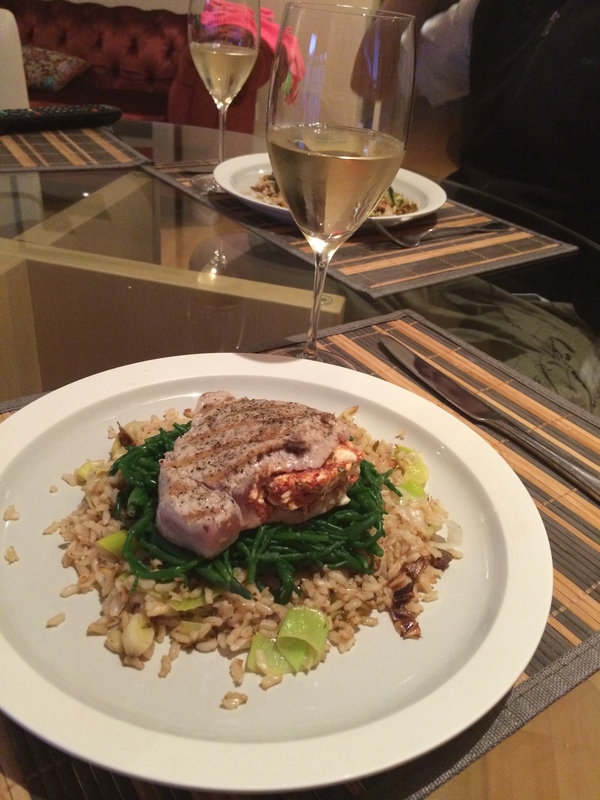 Serve over a bed of rice and samphire and eat immediately.